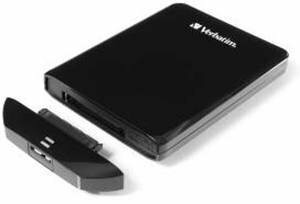 Verbatim introduces the Store 'n' Go Universal Storage Module (USM) portable hard drive, a flexible storage solution that can connect to your PC via a wide variety of interfaces. By default the USM Hard Drives ship with a USB 3.0 cable, but other options include FireWire, Thunderbolt and SATA. Universal Storage Module (USM) is a new standard that enables you to plug in USM storage devices into a USB slot that provides both power and data transfer, without requiring extra cables. Seagate and Lenovo are already shipping USM products, with more firms expected to follow later this year and in 2013. The USM Hard Drive from Verbatim ships in 500GB and 1TB capacities for 89.99EUR and 129.99EUR, respectively.